This article is about the heraldic dragon. For the snooker player with the same nickname, see Matthew Stevens. The Welsh Dragon (Welsh: Y Ddraig Goch, meaning the red dragon, pronounced [ə ˈðraiɡ ˈɡoːχ]) appears on the national flag of Wales. 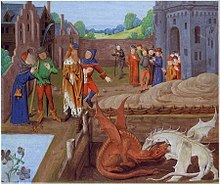 The oldest recorded use of the dragon to symbolise Wales is in the Historia Brittonum, written around AD 829, but it is popularly supposed to have been the battle standard of King Arthur and other ancient Celtic leaders. Its association with these leaders along with other evidence from archaeology, literature, and documentary history led many to suppose that it evolved from an earlier Romano-British national symbol. 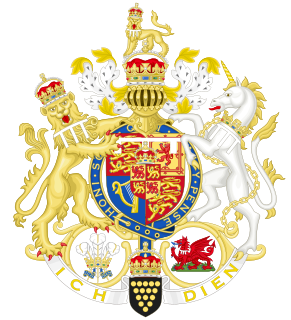 During the reigns of the Tudor monarchs, the red dragon was used as a supporter in the English Crown's coat of arms. The red dragon is often seen as symbolising all things Welsh, and is used by many public and private institutions. These include the Welsh Government, Visit Wales, the dragon's tongue is in use with the Welsh Language Society and numerous local authorities including Blaenau Gwent, Cardiff, Carmarthenshire, Rhondda Cynon Taf, Swansea, and sports bodies, including the Sport Wales National Centre, the Football Association of Wales, Wrexham A.F.C., Newport Gwent Dragons, and London Welsh RFC. The Welsh Dragon is also one of The Queen's Beasts. Vortigern and Ambros watch the fight between the red and white dragons: an illustration from a 15th-century manuscript of Geoffrey of Monmouth's History of the Kings of Britain. The tale is taken up in the Historia Brittonum. The dragons remain at Dinas Emrys for centuries until King Vortigern tries to build a castle there. Every night the castle walls and foundations are demolished by unseen forces. Vortigern consults his advisers, who tell him to find a boy with no natural father, and sacrifice him. Vortigern finds such a boy (who is later, in some tellings, to become Merlin) who is supposed to be the wisest wizard ever to live. On hearing that he is to be put to death to end the demolition of the walls, the boy is dismissive of the advice, and tells the king about the two dragons. Vortigern excavates the hill, freeing the dragons. They continue their fight and the red dragon finally defeats the white dragon. The boy tells Vortigern that the white dragon symbolises the Saxons and that the red dragon symbolises the people of Vortigern. If Vortigern is accepted to have lived in the 5th century, then these people are the British whom the Saxons failed to subdue and who became the Welsh. The same story is repeated in Geoffrey of Monmouth's History of the Kings of Britain, where the red dragon is also a prophecy of the coming of King Arthur. Note that Arthur's father was named Uther Pendragon ('Pendragon': 'Pen' (Head) and 'Dragon', being translated by Geoffrey as "dragon's head"). c.1400 – c.1416 Y Ddraig Aur, royal standard of Owain Glyndŵr, Prince of Wales, famously raised over Caernarfon during the Battle of Tuthill in 1401 against the English. Owain Glyndŵr's banner known as Y Ddraig Aur or "The Golden Dragon". It was famously raised over Caernarfon during the Battle of Tuthill in 1401 against the English. The flag has ancient origins; Glyndŵr chose to fly the standard of a Golden dragon on a white background, the traditional standard that, supposedly, Uther Pendragon had flown when the first Celtic Britons had fought the Saxons to a standstill almost 1,000 years before, which had been passed down to his son king Arthur. Henry Tudor flew the red dragon of Cadwaladr ap Cadwallon as his banner, overlaid on a green and white field representing the Tudor House, when he marched through Wales on his way to Bosworth Field. After the battle the flag was carried in state to St. Paul's Cathedral to be blessed. Odious design expressing nothing. but spite, malice, ill-will and monstrosity. Wd. rather be on R[oyal] Arms. This (dating from Henry VII) will be something. In 1956, this badge was added to the arms of the Welsh capital city Cardiff by placing it on collars around the necks of the two supporters of the shield. The badge was the basis of a flag of Wales in which it was placed on a background divided horizontally with the top half white and bottom half green. In 1959, Government use of this flag was dropped in favour of the current flag at the urging of the Gorsedd of Bards. 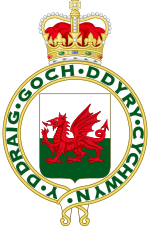 The badge is currently used by the Wales Office and is printed on Statutory Instruments made by the National Assembly for Wales. The badge was previously used in the corporate logo of the Assembly until the "dynamic dragon" logo was adopted. This Royal badge was supplanted by a new official Royal badge in 2008, which eliminated the red dragon altogether. The Welsh Dragon motif of Felinfoel Brewery. The Welsh Dragon on a trig point at Twyn y Gaer hill fort, Mynydd Illtud. The Welsh Dragon as one of The Queen's Beasts. A statue of the Welsh Dragon at Capel Moriah. Royal standard of King Henry VII used at the Battle of Bosworth Field. Red Dragon sculpture, Welsh Memorial Park, Ypres. ^ Davis, Dai. 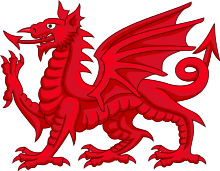 "Y Ddraig Goch – The Red Dragon". welshflag.org. Archived from the original on 9 August 2012. ^ Hackett, Martin (15 July 2014). "Lost Battlefields of Wales". Amberley Publishing Limited – via Google Books. ^ Davies, John (25 January 2007). "A History of Wales". Penguin Adult – via Google Books. ^ Breverton, Terry (15 May 2009). "Owain Glyndwr: The Story of the Last Prince of Wales". Amberley Publishing Limited – via Google Books. ^ "The Gazette - Official Public Record". gazettes-online.co.uk. ^ "Highlights of new Freedom of Information releases in August 2007 > The Cabinet Secretaries' Notebooks (CAB 195/11) > Arms for Wales". The National Archives (United Kingdom). Archived from the original on 3 November 2007. ^ "Wales: History of Welsh Flags". flagspot.net. ^ "WELSH FLAG (Hansard, 23 February 1959)". hansard.millbanksystems.com. ^ "Office of the Secretary of State for Wales - GOV.UK". www.walesoffice.gov.uk. ^ "Welsh Statutory Instruments – Town and Country Planning, Wales" (PDF). opsi.gov.uk. ^ "BBC NI - Learning - A State Apart - Intergovernmental Relations - Overview". www.bbc.co.uk. European dragons are legendary creatures in folklore and mythology among the overlapping cultures of Europe. Uther Pendragon, also known as King Uther, is a legendary king of sub-Roman Britain and the father of King Arthur. A few minor references to Uther appear in Old Welsh poems, but his biography was first written down by Geoffrey of Monmouth in his Historia Regum Britanniae, and Geoffrey's account of the character was used in most later versions. He is a fairly ambiguous individual throughout the literature, but is described as a strong king and a defender of the people. Dinas Emrys is a rocky and wooded hillock near Beddgelert in Gwynedd, north-west Wales. Rising some 76 m (250 ft) above the floor of the Glaslyn river valley, it overlooks the southern end of Llyn Dinas in Snowdonia. The Crystal Cave is a 1970 fantasy novel by Mary Stewart. The first in a quintet of novels covering the Arthurian legend, it is followed by The Hollow Hills. Rhondda was a local government district in the geographical area of the Rhondda Valley, south Wales. The white dragon is a symbol associated in Welsh mythology with the Anglo-Saxons.